It’s been a busy few months. 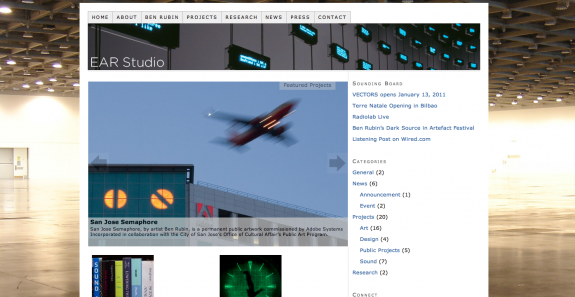 In addition to launching a new photography site, this past November, we helped relaunchÂ EarStudio.com, a digital media studio founded by artist Ben Rubin.Â Ben has collaborated with great folks like Laurie Anderson, Paul Virillio and Diller+Scofidio/Renfro. In 2007, he was commissioned to installÂ Moveable Type in the NYTimes building. Using WordPress + the Thesis Theme, we were able to deliver a fully manageable site. The new site includes a featured content gallery, a blog, galleries within every page (using the Simpleviewer wordpress plugin), and a completely customizable sidebar. And because we’re using the Thesis Theme Framework, he can update a majority of his fonts and colors without knowing any CSS code. Check out the site and let us know what you think! And if you live in NYC, make sure to check out his new solo show at Bryce Wolkowitz Gallery. It’s awesome!